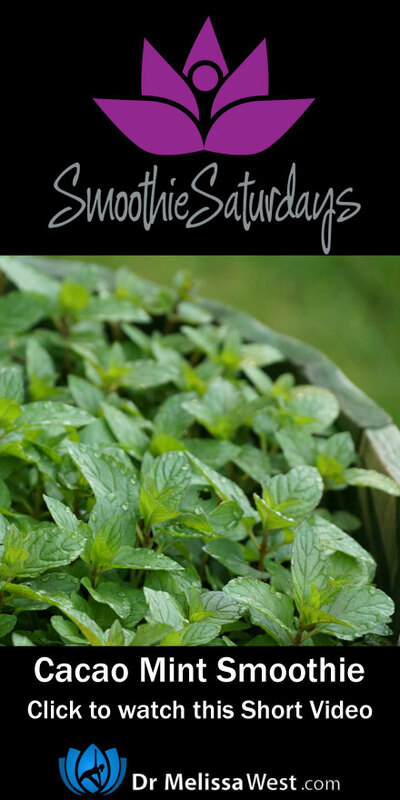 One of my favourite combinations are chocolate and mint and we are going to recreate it today in a healthy way with cacao – raw chocolate and fresh mint from the garden. Cacao has been hailed a super food, however I actually do approach it with caution. I found a really great article that I will link to in the show notes about approaching cacao with caution as well. The big thing to be concerned with is the caffeine and its effects on your adrenals and your nervous system. Raw cacao is touted for its high levels of antioxidants and magnesium. I myself abstain because I am highly sensitive and migraines. Carob would be a much better choice, but since most people will have raw cacao on hand I thought we would make a raw cacao mint smoothie for today’s treat. Toss all the ingredients into a blender– start with the liquids first. Add ice and blend until smooth.